Home »Movies»Mind The Gap»Mind The Gap: You Haven’t Seen Gattaca? Mind The Gap: You Haven’t Seen Gattaca? We at Deadshirt like to fancy ourselves pretty dedicated to popular culture with a combined knowledge of all things media that borders on the encyclopedic, but no one is perfect. There’s just too much music, too many films, too many comics, and way too many television episodes out there. No longer will we have to harbor the secret shame of not having experienced an expected work. Here is where we fill in the missing gaps. 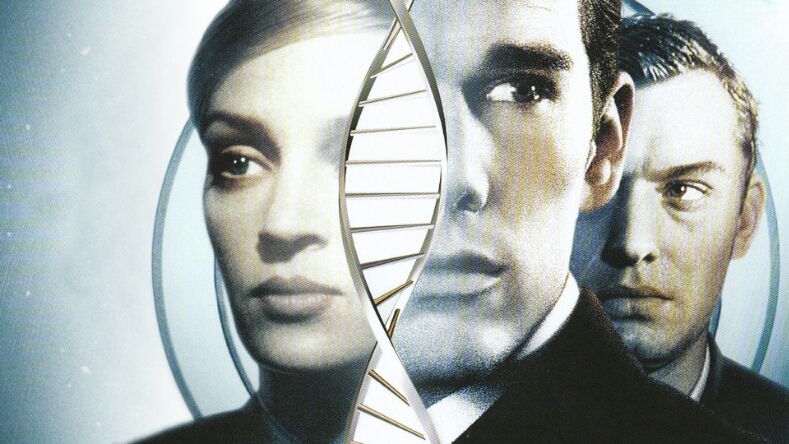 This week, Madie Coe takes a look at ’90s science fiction staple Gattaca. I’m not entirely sure how I got through years of devouring dystopic fiction and films and never touched Gattaca, despite it being on every Sci-Fi You-Need-To-See-This list ever. Given its reputation, I was surprised to learn that it had done poorly at the box office despite the critical acclaim. I also expected it to be a lot darker. In a not terribly distant future, we have the ability to genetically manipulate children in the womb and unlock the best genetic traits they have to offer, eliminating disease and mental illnesses like alcoholism or depression, and improving eyesight and physical capabilities. Even with these medical advancements, some people choose to conceive naturally, leaving their children (known as faith-births, and later in-valids) susceptible to these disadvantages. Our protagonist Vincent Freeman (Ethan Hawke) was born without modification and diagnosed with a variety of disorders and an estimated life span of only 30 years. His parents conceived again, and this time chose to create a genetically superior brother worthy of his father’s name. Vincent spends life in the shadow of his brother, but dreams of being an astronaut. However, access to your genetic information is easily available to institutions, and those with superior manipulated genetic code (Valids) are given access to the best schools, jobs, etc. solely on the basis of their DNA. Vincent won’t even be seen for interviews, and finds he is eligible only for manual labor. Vincent finds work in the cleaning crew for Gattaca Aerospace Corporation and decides to take his fate into his own hands. He contacts a man who connects him with a genetic donor; a “borrowed ladder”. This donor, Jerome Eugene Morrow (Jude Law), is a former swimming star who is genetically perfect, but a car accident has made him a paraplegic, shattering his dreams. Vincent modifies his appearance and uses genetic samples from Jerome/Eugene to assume his identity so that he can see space. Years of carefully laid plans start to unravel when an executive at Gattaca is murdered, and the police discover some of Vincent’s real, unauthorized DNA at the office. The film details Vincent’s genetic heist, Eugene’s depression, and the detectives trying to find a murderer in a world of perfection. Gattaca is a visually clean film. The editing is simply gorgeous, and it manages to be both retro and modern in design. Think 1950’s aesthetic with a streamlined contemporary touch to the clothing, cars, and architecture. Predating The Matrix by only 2 years, we don’t yet see the visual dichotomy of gritty darkness versus stark whiteness that seems to dominate later dystopic films. Despite the clean throwback visuals, the cinematography employed is a little shakier during the scenes of emotional height, which lends a more visceral human appeal when love interest Irene (Uma Thurman) takes Vincent/Jerome to see the solar fields, and when they consummate their relationship in the alley after being chased out of the nightclub. I’m not so sure how I feel about the fact that Vincent still has to modify himself in order to achieve his dream. Vincent becomes obsessive about his appearance and persona. This is necessary for his survival in a world of genetic tracking, but it seems to consume him as he obsessively scrapes, sloughs skin, plucks hair, etc. to eradicate all traces of himself from himself. However, everyone with a place in society (our present society as well as the vision present in Gattaca) has to adjust in some ways to do anything. And it is nicely counter-balanced with the fact that Irene and Eugene are both examples of “perfection” still not guaranteeing success. Eugene’s inability to reconcile his perfection is not the result of his accident, but the cause of it. We discover that he came in second in a swimming race despite having the best possible opportunity to win with his body chemistry, second when every marker pointed to his being the absolute statistical best. (We’ll assume for the sake of suspension of disbelief that being Jude Law-shaped rather than having Michael Phelps’ gargantuan gangly limbs is the most aerodynamic type for aquatic athletes.) After his botched suicide attempt, he throws himself into alcoholism and smoking. I think this, too, is interesting because alcoholism is one the things that babies are screened for as a trait to eliminate, so for him to develop the tendency after being genetically enhanced not to is almost like a dark parallel to Vincent’s own journey to overcome genetic destiny. The ending feels a little too dreamlike and perfect, with Vincent saving his brother from drowning yet again, but it’s not mentioned as he jets off to space. One could almost theorize that Vincent did drown, as the last shot of that scene is him staring up at the stars after his heart “almost” gives out from the strain. I wanted for something bad to happen, like all the employees going into space were really killed off a la Soylent Green. I was waiting for a conspiracy or mind-blowing moment, but it really was just us, humans, discriminating in our usual way, just with better technology. This film is about making your own destiny, despite what it is written in your genetic code, a surprisingly hopeful message. Gattaca wasn’t what I expected going in; it wasn’t as ground-breaking as I feel like it’s been given credit for, but it’s a well-made film that has held up well considering how quick futuristic movies tend to age. Definitely a film to keep in mind when filling in the gap. Click HERE to read more installments of Mind The Gap. Hey, I usually never spam my posts under different articles. Gattaca is one of my (if not “the”) favourite movies. I am glad there are other people who can value it as well. You did analyse the film quite well, pointing out certain aspects that could have been improved or avoided and in particular the last paragraph proves that you have understood it.